Steve Brown speaks in the DeSantis Family Chapel at Palm Beach Atlantic University, West Palm Beach, Florida. 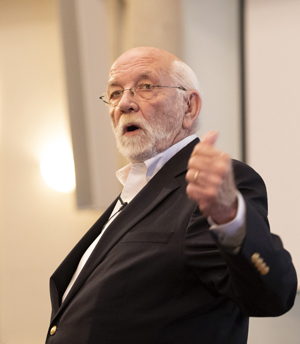 If Steve Brown’s rich, deep voice didn’t grab the attention of the chapel audience earlier this month, his message did. “There are times when anger is appropriate. There are times when niceness doesn’t fit. There is a time – and you have to be so careful – that you are called to be angry,” Steve Brown, founder of Key Life Network and author of several books including, “No More Mister Nice Guy,” a book about Christian boldness, said. Brown quoted from the fourth chapter of Ephesians, where Paul writes “be angry but don’t let the sun go down on your anger.” Brown continued with other scriptural examples, including Matthew 23 and 24 (destruction of the temple), saying, “That is an angry man and his name is Jesus. And if you move into the 24th chapter in the temple, he does things that a real Christian would not do.”In another example from Galatians1:6, Paul admonishes the community for turning away from his teaching. Indeed, Jesus said and did unexpected things, things that were counter to the conventional teachings of the time. Brown pointed to “one of the most amazing and radical texts in the Bible.” He told the story from Luke 7 where Jesus forgives the prostitute who breaks the social code by approaching him while he is dining at the home of a Pharisee. “The woman sinned a lot and was forgiven,” Brown noted, leaving those who witnessed the event perplexed. “The message of the Gospel (is) that (it) changes the world. It is nothing else,” Brown said. “Jesus refused to sand down the radical nature of the Gospel to please hyper-religious people. Brown, who was introduced by University Trustee Rev. “Lucky” Arnold, is no stranger to the PBA campus. Brown was among the leaders who are part of the Breakfast with Fred mentoring program. Referring to the state of the nation, Brown commented, “Things are really bad, guys, they really are. We are divided and we are angry. And you can’t help but be caught up in it.